What are Cognitive Skills? Many think people of education as learning to read, write, do mathematics, and then applying this knowledge in science, history, and social studies. However, in order to succeed in learning academic knowledge, one must first have the thinking skills, such as attention, memory, processing speed, logic and reasoning skills. These skills provide the foundation of how people learn and remember both academic information and the skills and information to function successfully in daily life. While the baseline for cognitive skills is innate, these skills need to be cultivated in childhood and adolescence and maintained throughout adulthood. Visual Attention, which is the ability to discriminate among stimuli one sees. Visual attention is critical to both reading and writing. Auditory Attention, which is the ability to discriminate among stimuli one hears. Auditory Attention is essential for understanding information in classroom as well as in social settings. Short-Term Memory is information an individual remembers for a brief period. This information may or may not be then coded into long-term memory. Working Memory is information recalled for the purposes ofproblem-solving, decision-making, reasoning and logic. 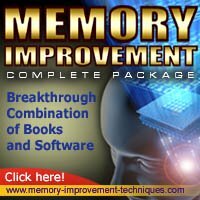 Long-Term Memory is information an individual remembers for a long period, up to their lifetime. These types of memories are important in daily functioning and in using reasoning and logic. Visual processing speed is the rate at which an individual is able to use information, which he or she can see. These skills are important in reading and writing. Auditory processing speed is the rate at which an individual is able to use information, which the person hears. Motor processing speed is the rate at which an individual is able to make goal directed and purposeful movements. Although the baseline for many thinking skills is innate, manysoftware programs are available for both adults and children to use to enhance cognitive skills, including Brain Train, Brain Fitand Luminosity.